A large machine firstly needs a large volume of material to build it, and secondly a large amount of power to get it going and to use it. The aim of this project within the European Union’s 7th Framework Programme is to improve the competitiveness of factories and to minimize their costs by cutting the consumption of machines, while maintaining the precision of their functions at the same time. To achieve this, Tecnalia has created machines that are not excessively rigid, are up to 40% lighter but equipped with intelligence that enables them to be as precise as their predecessors, if not more so. Right now, there are two prototypes of this concept of light, intelligent machine: one of them is located at the machining centre company Ibarmia in Azkoitia (Gipuzkoa, Basque Country); and a second unit is at the company Nicolás Correa, a manufacturer of large milling machines in Burgos (Spain). 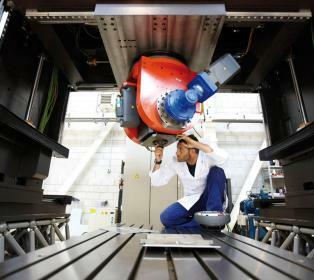 “These prototypes are proving themselves to be not only capable of maintaining the productivity of the heavy machine, but of increasing it,” asserted Juanjo Zulaika, head of the project at Tecnalia. This new type of machine means an advantage for the factories destined to work with them, as well as for their manufacturers. The factories will save energy thanks to the fact that the machines consume less, and the manufacturers will be able to compete in terms of costs against other countries. Tecnalia is already working on the following steps on the basis of DEMAT. Firstly, it will be extending this same concept of intelligent flexibility to other classes of machines, like drilling machines, for example. Secondly, it will be exploring the introduction of new functionalities into these machines.